The experiences that will make this journey magical and unique, will focus on discovering the culture of the Mediterranean, including the very ancient traditions from cooks, to makers and artisans across the island. 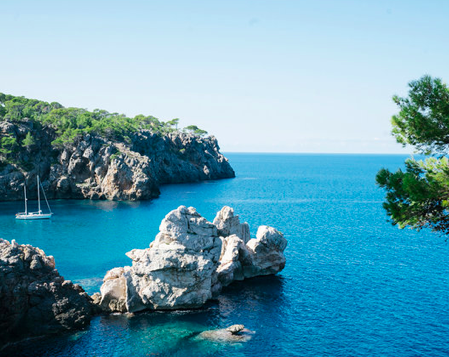 An array of workshops, excursions and visits will set the tone for our journey which will be centered on the enchanting way of life in Mallorca. Carmen Ruiz de Huidobro (a LIBERTY member), along with food expert, co-host Deborah Piña, will be hosting their third 'Mediterranean Retreat'. This Españolita Retreat will be hosted in a dreamy privately owned estate, built over olive tree groves. Son Rullán is a quiet rustic oasis hidden in the heart of the Tramuntana mountains, close to the beautiful town of Valldemossa, and from which guests can admire the gorgeous Mediterranean sea view, or swim in the pool. The house and gardens are full of enchanting corners ideal for meditation and reading. From there we will set off to our different activities, site visits, and workshops. LIBERTY HOOK-UP: 15% off Super Lux, Lux and Double Rooms. We will take a guided tour to a village farmers market where we will source ingredients for our cooked meals, using the most colorful seasonal produce. We will do a wine tasting in the vineyards while we slowly enjoy an open fire, and get to see the sunset by the sea from one of the most magical viewpoints on the island. We will walk through olive tree groves, off the beaten path, and learn the processes of ancient oil mills, while tasting the most delicious varieties. We will discover old towns and enchanting villages, making this experience utterly unique. We will spend one day at sea on an antique vessel, where we will prepare a mouth-watering lunch and discover wonderful coves to swim in. We will also visit tapas bars and other restaurants in the city of Palma, and get a chance to do some shopping. We will learn wood carving from a local artist and indulge in cooking sessions. All the while, we will be examining local cuisine through patio dinners and gatherings under the stars. • A day in the countryside cooking traditional dishes. • Wine tasting in the vineyard. • A walk through an olive grove and an Olive Oil Workshop. • A visit to a village market. • An evening discovering the city of Palma. • A day out at sea on an antique boat exploring hidden gems. • An opportunity to meet local creatives at our farewell dinner. • Discussions about Mediterranean history through food while sitting around the table. This intimate, 7 day/6 night retreat will be open to only 12 guests. We believe it will be an enriching journey of discovery that will certainly open your eyes to the unique and fascinating way of life in the Mediterranean and its culture. Through a beautifully designed itinerary and our stay at an incredibly charming and rustic home the experiences aim to really make guests indulge in the beauty and tastes of the island. From Thursday May 16th through Wednesday May 22nd 2019. The retreat will be an extraordinary 7 day/6 night journey through the Mediterranean island of Mallorca. Arrive morning Thursday May 16th and depart by noon Wednesday May 22nd, 2019. Spain- the closest airport is Palma de Mallorca (PMI). The trip is for creatively-inspired people from all walks of life who have a love of travel and food. Open to singles, couples and friends traveling together. The retreat will take place in English. • Transfers to and from the Palma de Mallorca Airport (PMI) on arrival and departure days, and all transportation during the trip. • Shared or private accomodation in Son Rullán, our gorgeous home & finca during the retreat. • All meals, drinks and snacks during your stay and on our site visits and activities. • All excursions and events, as well as frequent cooking sessions with your hosts. • A day out at sea on an antique boat, indulging in the clear waters of the north coast. • A wood workshop. Where we will be able to create a piece to take home. • A special, curated selection of gifts during your stay.